Stade Francais lock Pascal Pape will lead France into this year's Six Nations despite the return to fitness of Toulouse flanker Thierry Dusautoir. Pape, 32, will continue in the role he occupied during the end of year internationals that saw France account for Australia, Argentina and Samoa with coach Philippe Saint-Andre opting to ease Dusautoir back into the international set-up. 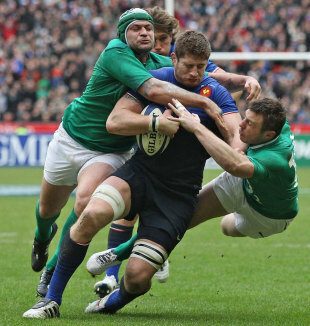 Dusautoir has led his country on 31 times and memorably steered them to the 2011 Rugby World Cup final in New Zealand where they were beaten by the hosts. The 31-year-old is also a former International Rugby Board Player of the Year. "Your captain has to be an automatic first choice," explained Sain-Andre. "With regards to Thierry, we don't want to put him under too much pressure. We want to give him time to come back. Pascal played very well in November. Once more it's a nice problem to have. If I only had problems like that, it would be brilliant." Saint-Andre confirmed his skipper having unveiled his latest squad that also sees a recall for Toulon centre Mathieu Bastareaud who has not featured for Les Bleus since 2010. Clermont fullback Jean-Marcellin Buttin also returns to the selection mix with Toulouse's Maxime Medard left out despite his recovery from a knee injury. The only uncapped player in the squad is 22-year-old Perpignan lock Romain Taofifeuna. "Maxime has made a good return to action but Jean-Marcellin (Buttin) plays more often in the 15," said Saint-Andre. "Of course, we will continue to follow Max Medard but we know he will need time to recover after an injury like his." The 33-man squad will be cut to 23 players on January 28 with France kicking off their Six Nations campaign against Italy in Rome on February 3.